After several hours during which it was assumed to be a very competent fake, Warner Bros. has confirmed that the autographed photo originally posted this morning on Ain't It Cool News is indeed our first glimpse of Tom Hardy as Max Rockatansky in Mad Max: Fury Road. 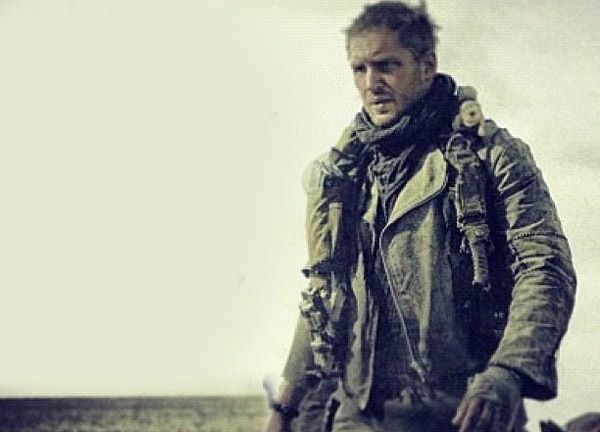 The photo, part of a signed set given to the crew by Hardy on the last day of filming — Fury Road wrapped on Monday — reveals little about the movie, aside from the slightly more modern look of Hardy's take on the character, and the fact that Hardy is extremely handsome even when you factor for the post-apocalyptic wastes of Australia. Gone is Max's trademark police-issue black leather jacket with a single oversized spaulder on the right shoulder. In its place is what appears to be a rough-cut leather jacket with a more contemporary military look. Obviously, it should be assumed that years have passed since we last saw Max and that he's long since run out of black polish, but it gives Max a subtle update that suggests the apocalypse happened more recently than the later years of the cold war. It's unwise to make predictions based on a single image, but to my eyes the most interesting thing about the picture is that you can kind of see a hint of the original plan for Mad Max 4. First conceived as an animated 3D film to be co-written and co-designed by cartoonist Brendan McCarthy, who's known for his long run on Judge Dredd in the anthology comic 2000AD, Max's uniform as seen here is definitely reminiscent of the kind of post-civilized militarism you see dripping from the pages of that book. As McCarthy is still credited as cowriter of the live-action Fury Road script, I look forward to seeing how much of his aesthetic vision made it into the finished film. Considering Fury Road is packed with Characters like Charlize Theron's Imperator Furiosa and Nathan Jones' Rictus Erectus, my guess is 'a lot. Follow Ross Lincoln on Twitter. Not so fast, Ross. Ignore the gear, and Hardy's jacket looks identical to the jacket from Mad Max beyond Thunderdome. Other photos show that the trousers and boots are the same as the original trilogy as well. Yes, the jacket looks the same, though it was lost on the final chase of the third movie, it looks like Max had the time to go back and find it. The story is supposed to be immediate to those last moments of Beyond Thunderdome. I rode to Clunes on the town bike, a kawasaki z200 from Noble Park. My 1909 Cadillac Headlight see's you in the dark.Rockatansky. This can be a truly great tip particularly to these fresh to the blogosphere. Short but extremely correct information... Numerous thanks for sharing this one. A should study post!